Thanks to Howard John Bird for his kind feedback after joining our dolphin trainer for a day program. A small note of thanks to you and your team of wonderful trainers for a fabulous day with your dolphins. As you know I have worked with many companies all over the world and think you are the best by far. My only sadness was the fact it was in Turkey as I would love to offer to help out as a volunteer this summer. Please thank also the photographer for making the disk. 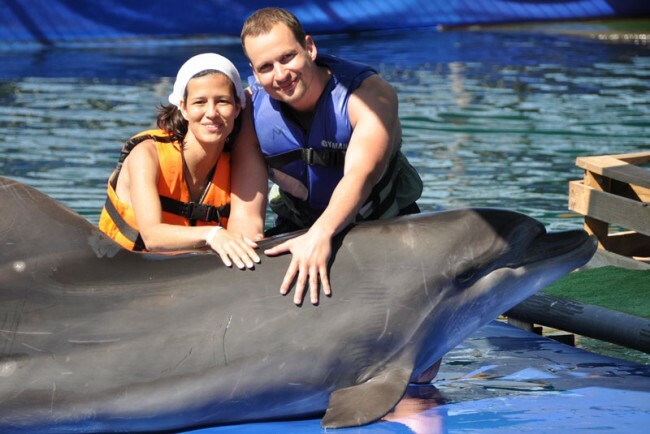 Visit our dolphin therapy center and see the dolphins, get a chance to learn about them and take some memorable photos. Dominik‘s Therapy was a wonderful time which brought about big changes. Dominik got on well with the therapists who cared for him, and naturally us too. We were very competently counselled and received a hearty welcome. We felt quite at home. Dominik can move his left hand much better than beforehand. Moreover he can stand up with support. His muscular system is much more relaxed. Dominik can pass various things from his left hand to his right and back again. His torso rotation has also improved. He can stand with support and walk in his trainer. The work of the therapists, the personnel and Dominik has initiated these changes. We, the family, especially Dominik, give again a big thanks to Frau Weis, for enabling us this opportunity. Dolphin therapy centers are not tantamount to dolphin shows, the manager of one such center off the coast of Marmaris has said ahead of a planned protest in April by a German dolphin-protection forum. They want to close the dolphin shows in Turkey but we are not a show, said Turgay Uykusuz, manager of Onmega, about the Wal- und Delfinschutz-Forum (Whale and Dolphin Protection Forum), or WDSF, which is organizing protests in Turkey against dolphin facilities. They also say that therapy is expensive and doesn’t work. What do they know? They should see some of our patients and talk with the parents of the children with disabilities who come here from all over the world before they say anything like that, Uykusuz told the South Weekly. Instead, he said he wanted the demonstrators to look at their own countries. Why don’t they close all the dolphin parks in Europe before they come here? Why not try to stop the dolphin massacres in Japan? Instead they compare us to Japan in their comments on Facebook. 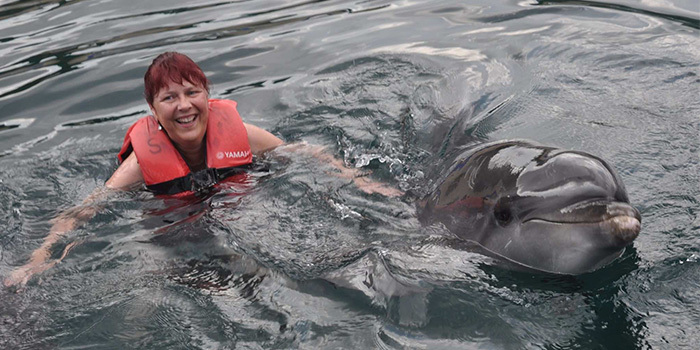 Onmega is a dolphin therapy center off the Marmaris coast. At a time when many are questioning the efficacy of dolphin therapy and are vociferously protesting against keeping dolphins in captivity for any reason at all, Uykusuz explained why the facility was important and should be allowed to continue its work in peace for the many families with children with disabilities who visit the center. For Uykusuz, Onmega is the finest facility in Europe. It is the first and only one in open water: much deeper and larger than any other and way above the European guidelines, he said. The three sea pens contain 16,000,000 liters of water. Compare that with the latest dolphinarium opened in Nürnberg, Germany, which has four dolphins in 5.5 million liters, he said. We have many testimonials saying that our method of dolphin therapy has long-term benefits for them and in some cases has changed lives, Uykusuz said, adding that helped adults and children that come to the center. The location is crucial, Uykusuz said with passion. In the sea, the water and currents keeps the water changing, which is healthy for the dolphins. This can’t happen in land parks, without machines and chemicals, which are disturbing and dangerous for the dolphins. Our dolphins, Flip, Daisy, Frosia and Splash have two purposes: two for therapy and two for a ‘swim-with’ program. This helps us to publicize what we do and to educate people about these amazing mammals. It also subsidizes therapy for those who couldn’t afford to come otherwise. The dolphins are quick to learn their role. It only takes three months. They really enjoy themselves and learn quickly. We give our dolphins the best veterinary care from abroad, as there are no expert dolphin vets here in Turkey, he said. 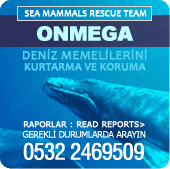 In the early days, the Onmega team hoped to be able to work with the owners of a dolphinarium in Kaş. 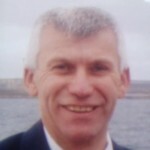 He admits that they were horrified by the conditions, but thought they could make improvements. We researched dolphin therapy and thought it would be possible to open a center there, he said. Unfortunately, despite their promises, the Russian owners didn’t comply with our requirements: the partnership was only for therapy but we split when we realized they were not prepared to change anything and were just using the dolphins for entertainment and profit. So we then decided to move to Marmaris and to establish the best dolphin park and therapy center both in Turkey and in Europe. Unfortunately, there are still no guidelines for dolphin parks in Turkey although ours has been used as an example to others of how it should be done, he said. Uykusuz joined the team at Onmega in 2004 having been skeptical about dolphin therapy. You know I am a member of Mediterranean Greenpeace. I hate to see animals suffering and until I learnt about Onmega Center therapy I was skeptical, too. But since then some of the results I have seen have been so amazing I have cried, he said. 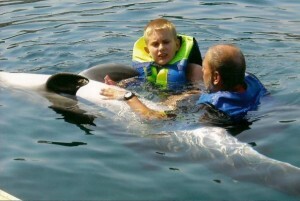 He recalled one case where doctors in Austria did not believe that dolphin therapy could help a child with severe disabilities from birth trauma and were reluctant to agree to fund dolphin therapy. 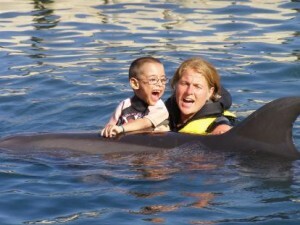 The case went to court where the judge awarded in favor of the child when it was seen how dolphin therapy had helped. We are providing an excellent service at Onmega, in an amazing environment, which is good for both dolphins and clients but we are being compared with cruel entertainment venues. It is obvious to anyone who cares to look that we are completely special and unique. Even more ridiculous, this group is not visiting dolphin parks in Istanbul and Ankara because ‘they are too far from Antalya.’ These people can’t pick and chose. Let them go away and do their research and stop doing these things for their own egos, he said. The dolphins at the Onmega Dolphin Therapy Center in Marmaris eat special foods brought in from overseas, according to manager Turgay Uykusuz. We give the dolphins extra minerals and vitamins bought from a specialist U.K. company and they also carry out regular blood tests. Our fish is the best: this is another problem for many dolphinariums because buying the correct varieties of fish for dolphins is so expensive when it is done properly. If we are at all suspicious about any consignment, we throw it away. We also send samples of the fish to İzmir or Bursa, where they test it for bacteria. We buy our fish ‘shock-frozen’ at -40 degrees Celsius and keep them in special freezers set at -25 degrees Celsius. All this is very important for the dolphins’ health as it protects them from any contaminants, Uykusuz told the South Weekly. Several special treatments are used at the Onmega Dolphin Therapy Center, according to its manager. We specialize in combining classical therapies such as physiotherapy, crania-sacral therapy and hippo therapy. Our clients have 10 45-minute sessions of interactive dolphin therapy, together with 10 sessions of classical therapies [either one chosen classical therapy or a mixture of them]. The created synergy increases the overall power and effect. And we have a wonderful team of expert humans, from all over the world, to work with them, Turgay Uykusuz told the South Weekly. People who have been in contact with dolphins say they have extraordinary experiences and there are many stories about how dolphins protect and save humans, like they are our protectors, he said. He also said dolphins should be kept in their natural environment. If they are not, they can’t use their sonar properly, [since they need that] to help people who are ill. It is a sort of catharsis: their sensitive ultrasound cavitation effect has extraordinary properties. You know, really they are rather like doctors. They can understand when a person is ill and help them. Of Onmega’s annual average of 150 therapy patients, most come from Germany, France, the Netherlands and England. Some patients come repeatedly because they see so much improvement. Dear friends, helpers and donators to the Aktion Delphin e.V. Our dream came true and we look back to an eventful time! From 03. – 17.07.2010 we were in Marmaris , Turkey, in the Onmega Dolphin park. During the journey Max was very nervous and excited. We believe that he sensed that a great event lay before him. 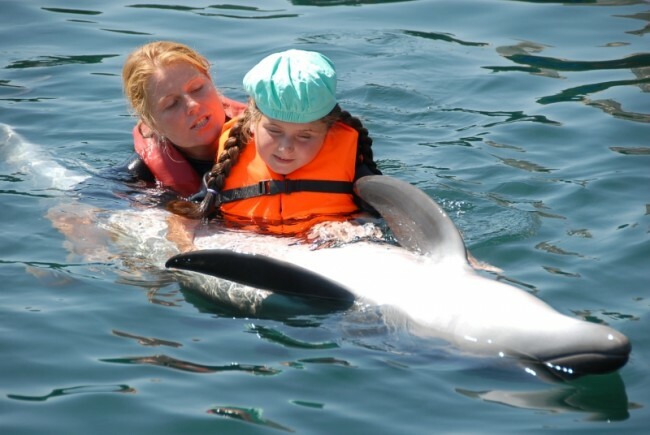 Dolphin Therapy presents a exceptional opportunity especially for children but also for adults with special needs to find new ways to health and/or to alleviate their ailments. In our Dolphin Therapy Center in Marmaris, Turkey, we offer our patients individually concerted therapies. Contact with our dolphins plays a central role. 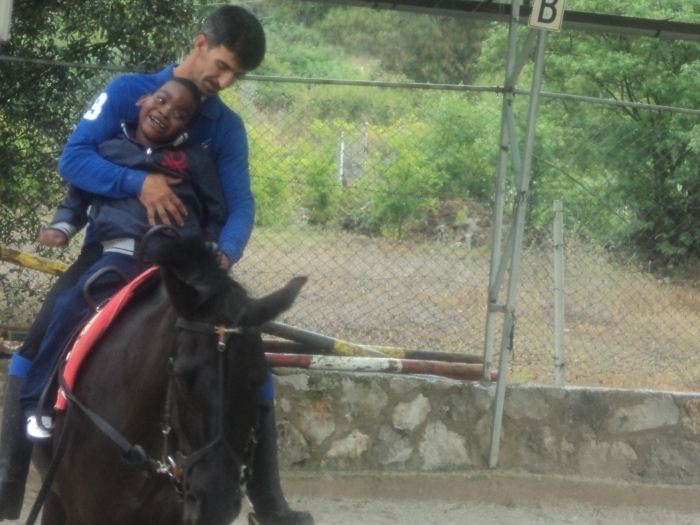 But a complete therapy is important, which is why Hippotherapy in a riding school, Physiotherapy, Cranio-Sacral and Ergo therapy are integrated in our programme. We receive many queries from affected parents as also from people interested in therapy. Now and then they are concerned or have reservations, this shows us how important it is to provide information and explanations with respect to Dolphin Therapy. This prompted us to organize a free Dolphin Therapy webinar. We will give first-hand reports on this interesting form of therapy and provide insights and background to our methods of work.